Five Ways to teach your dog that coming to you is the best thing ever! If you want your dog to come when you call, you need to get into his head that arriving with you is the best thing ever! Instead of asking your dog to leave an exciting something to come to boring you, change his mindset so that he sees your call as an opportunity to spin on a sixpence and race straight to you like a missile. 20-week-old Rocco races to his owner at high speed! 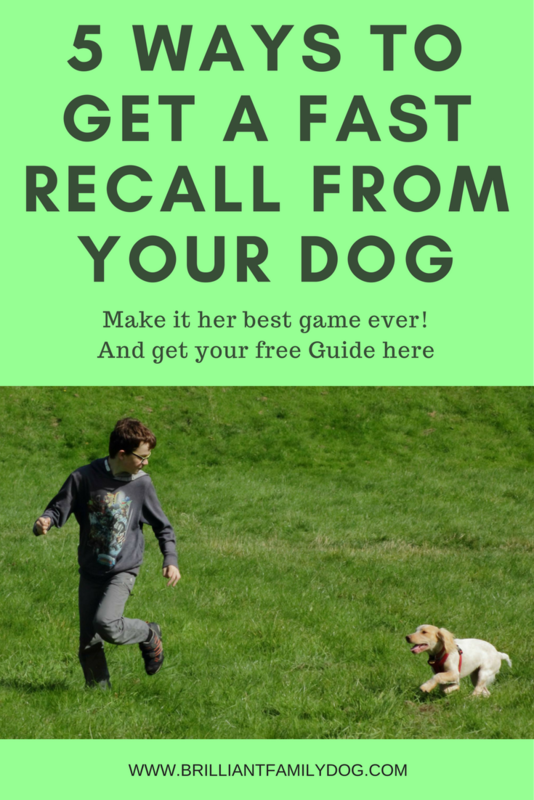 Get your free download and transform your dog's recall straight away! 1. NEVER, EVER, reprimand your dog when he comes to you. If he runs to you and you tell him off, how likely is it that he’ll come next time you call? It doesn’t matter what he did when he was “out there” - coming back to you has to be the best thing he ever did. Be sure he knows that his prompt return always makes you very, very happy! 2. NEVER go on a walk without a stash of really good treats in your pocket. ”Really good” does not include his kibble, cat biscuits, or pocket fluff. Rather - cheese, sausage, hot dog, beefburger … If you did a good turn for someone and they gave you a dry biscuit as a reward, how likely would you be to put your hand up next time they’re looking for a favour? A whole chocolate cake? Now that’s a different matter! 3. NEVER call your dog, and - when he doesn’t respond - say “Ah well, I’ll call him a bit later.” This has been noted, documented, and logged by your dog, and filed under the heading “I only need to come when I’m called sometimes.” This is the absolute last thing we want him to learn! He needs to know that when he hears his name, he comes back - every time. 4. ALWAYS vary your rewards. Sometimes he gets a lump of beefburger when he arrives with you; sometimes he gets 1 - 2 - 3 - 4 - 5 - 6 tiny bits of cheese posted into his mouth one after the other; sometimes you hurl his toy behind you as he approaches, then race him to the toy; sometimes as he runs towards you you take off at high speed away from him - game on! - dogs all love to chase! What else could you do to excite your particular dog? 5. NEVER call him unless you have a 90% chance of him coming. Choose your moment, call him and refer to no.3 above. He doesn’t come? Then if the mountain won’t come to Mohammed, Mohammed must go to the mountain. Go up to him and call him from one yard away. Success! Big lump of sausage! How soon should I start training my puppy to recall? As soon as you get your new puppy or new dog, they should be learning that responding to their name is the best thing ever. Read this post to give you a start. Dogs love running fast. Make sure that running fast towards you is always more rewarding than running fast in the opposite direction. It takes time and steady application to develop a super recall. But think how proud you’ll be when you can call your dog’s name (once!) and he stops dead, spins round, and hurtles back to you! And think how relieved you’ll be if he had been racing towards a road, or a sabre-toothed tiger (or whatever hazards you have in your neck of the woods). Want a bit more help with your recall? You’ll love this new course that's now open for enrolment! and have a thumping good recall in a matter of weeks! Our family’s always had dogs, why is this one so difficult? “Archie just goes mad,” said Anne. And then, when we go out, he’s not at all friendly with other dogs. Some children were rushing past on their scooters the other day - I thought he was going to grab them! We’ve always had dogs - but I’ve never had one like this before! This is a shame. Anne was very pleasant, well-meaning, and obviously devoted to the naughty Archie. When I visited her I saw the life that Archie lived and found the root of the problem fairly quickly. Anne was indeed experienced with dogs. For forty years there had always been a family dog. Now she had the dog … but no family! Her previous dogs had been brought up in the rough and tumble of family life. From morning till night (and sometimes during the night) there had always been activity. The electric energy children bring to a home was ever-present. Learn new force-free ways to teach your new puppy! Housekeeping in a busy family was basic maintenance, not perfection. And then there were the school runs, walks to the shops, family holidays on the beach. Archie’s predecessors had had a very different upbringing! And Archie had missed out on all of this. • The house was painfully quiet - and spotless. Anne was very, very houseproud. So while Anne thought she was rearing her young dog the same way as her previous family dogs, in fact she was missing a huge chunk of his essential upbringing! "I'm bored! If something doesn't happen soon, I'll have to make it happen!" In this case we started a program of belated socialisation and habituation, Archie came to class and was very quick to learn the games and tricks I teach there, and Anne learnt that mental stimulation is infinitely more tiring than physical exercise! You cannot “socialise” an older dog. This is something that can only happen in the dog’s brain up to the age of 15-16 weeks. What you can do is get him out and about, having new experiences, and enjoying them! If he’s not enjoying - for instance another dog walking towards him - then about turn and withdraw to a safe distance where he can observe the dog passing while you pop treats into his mouth. The distance will vary, but could be at least 50 yards. Anne didn’t need to take Archie on ever longer walks, building his stamina so that his energy was boosted - just spend a few minutes here and there during the day when she could play some of the games and tricks he’d learnt in class, and mind games to satisfy his busy brain. Here's a great book to get you started. As a working dog, Archie quickly took to the games which involved his amazing powers of scent. Hide and Seek, in the house and the garden, became very popular! We even taught Archie some useful tricks: fetching Anne’s indoor shoes when they arrived back from a walk was very popular all round. It gave Archie a job to do straight away, and Anne was able to dry his feet when he brought her shoes, before he’d started running all over the house. 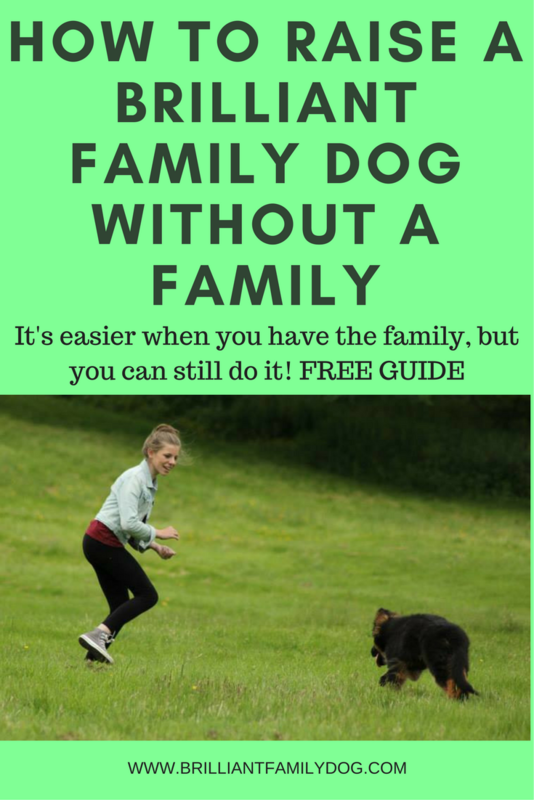 Family Dog but no family? Children go so well with puppies! • Early socialisation to everything in our world is vital. This includes towns, shops, countryside, schools, fairs, horses, bikes, trains, dogs, children, etc. “Early” means from the day after your puppy arrives, at 8 weeks. • Mental stimulation is more tiring and satisfying than physical exercise alone. This was a big surprise to Anne! • Care less about the spotlessness of your home - you have a dog! Most of all, enjoy your puppy!